July 2011 - The Department of Homeland Security has discontinued the Homeland Security Advisory System and replaced it with something else. The rest of this page is retained for historical interest. I do not plan to upgrade the Homeland Security Threat Monitor. In early 2002, the President of the United States George W. Bush created the Department of Homeland Security which is responsible for protecting the nation against the threat of terrorism. 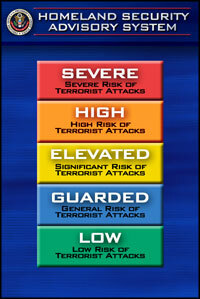 The Department of Homeland Security introduced the Homeland Security Advisory System that uses a color-coded scale of threat levels to communicate with the public about the general severity of current terrorist threats against the nation. The Department of Homeland Security shows the current threat level on their web site. The Homeland Security Threat Monitor is a small Windows application that runs in your system tray, showing the current terrorism threat level. It periodically checks to make sure the information is up to date by contacting the Department of Homeland Security web server. Unobtrusive placement in the Windows tray. Blinking notification of increased threat level. Cooperates well with dial-up connections. There is no formal installation procedure for the Homeland Security Threat Monitor. Download the zip file, unzip either all its contents or just the threat.exe program file, and run it. You may want to create a shortcut in your Startup program group so the application starts whenever you start your computer. The green color in the above examples represents the Low threat level. This color will change as the threat level changes, ie. it will be yellow for Elevated. Attempt to contact the Department of Homeland Security web server immediately to update the current threat level. Once a successful contact is made, a confirmation message will be displayed. If no contact is made within 60 seconds, a message will be displayed and you will be asked if you wish to continue trying. Activate your web browser and go to the Department of Homeland Security web site. Show information about the Homeland Security Threat Monitor, including a link to the original location of this web page. Close the Homeland Security Threat Monitor application. No icon or further updates will be shown until the application is restarted. When the Homeland Security threat level changes to a higher level, the icon in the tray will blink. This is to let you know that the Attorney General has increased the threat level. When you click on the icon, a message will be shown that informs you of the new threat level. For more information on the current threat, you should visit the Department of Homeland Security web site. While running, the Homeland Security Threat Monitor checks the current theat level status on the Department of Homeland Security web server every seven hours, whenever the application is started, or whenever the "Update now" command is selected. If you use a dial-up connection, and it is time for a scheduled update and you are not connected to the Internet, the application will wait until you do connect to perform an update. The application will never request that an automatic connection be made just to check the threat level. Whenever the application is started, it automatically makes a connection to the hewgill.com web server to check for a new configuration file. This configuration file tells the program which web page at the Department of Homeland Security to examine to obtain the current threat level, and what information to read from the page. This feature exists so that if the Department of Homeland Security changes their web page layout, a new version of the configuration file will automatically be used. The current configuration file can be viewed here (it is an XML file). This is the only section of the registry that is modified by the application. This effort was inspired by a similar Mac OS X application somebody showed me one day. There is a CGI version for webmasters available at cgiexpo.com. The source code for Homeland Security Threat Monitor is available for download. Okay, I admit, this is a totally silly and pointless piece of software. If you live so much in a box that you don't read, watch, or listen to any news at least once every couple of days, perhaps this application will help keep you in touch with reality. If you do try to keep up with world events, you will probably hear about a significant terrorism threat through some other means before this program gets around to letting you know about it. This program is just for fun, despite its serious theme. Finally, a disclaimer: This program does not present official information. The information provided by this program must never be used in making actual decisions. Please contact an official source or your local authorities if you are ever unsure what to do in case of the threat of terrorism.